MeetingBase© is an organizational tool that is integrated with other CDM systems such as TraumaBase©, NeuroBase© and ResearchBase©. These systems and MeetingBase© work hand-in-hand to organize and track patients, CQI issues, patient meetings, and non-patient meetings. MeetingBase© helps you to organize your paper trail, provider’s activities and multi-level in-depth reviews. This database is used for all your various performance improvement meetings. 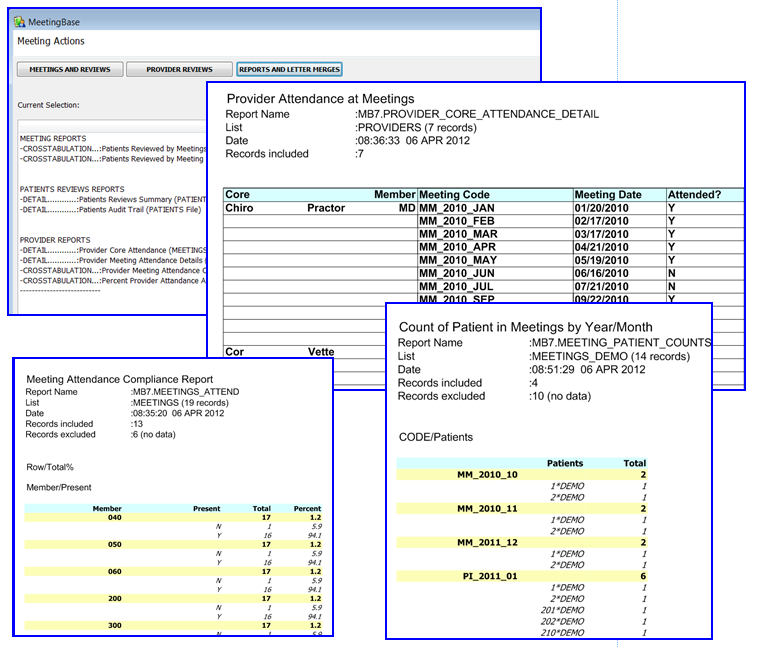 Enter, maintain and report meeting minutes, agendas, attendance, providers, patient case summaries all in one system. Information can be easily retrieved to produce documentation and correlate patient and provider information. All crucial aspects of the performance improvement process are now easily reportable. Reports can include topic, patient, or team specific details. Attendance can be tracked and reported. Monitor committee work, case progress and outcomes all in one system. Reports interface seamlessly with Word and Excel. MeetingBase© substantially reduces time-laden processes essential to departmental functionality! MeetingBase© is designed to streamline processes for managers, administrators, CEO, PIPS coordinators, and Committee Liaisons. Easy-to-use tools provide monitoring of committee work, progress and outcomes. Integrated data files provide smooth and quickly retrievable comprehensive information.